Do you want to reserve? Tel: +34 922 716 645 from 07:00 a.m. to 10:00 p.m.
Our excursion brochure will give you the information you need about our offers and details of them. The Internet tourism market is booming and reality shows that it will continue to grow, given that more and more people are interested in planning their trips from their computer. At Atlantico Excursiones we have an extensive catalog of products and services offered by companies throughout the Canary archipelago: Walking tours, guided tours of monuments and cities, outdoor activities, ticket sales, events, congresses, etc. Do you need help to make the reservation online? How do I know it is safe to book online? Using your credit card to reserve a room or tour online with Atlánticoexcursiones.com is 100% safe, we use the most advanced encryption technology in order to protect your card data. I get an error when trying to pay with my credit card, what can I do? The process of booking Atlantic Excursions is completely automatic and all transactions made with a credit card are 100% secure. If the credit card gives you a permanent error, verify that it has not expired . Can I reserve more than one activity? You can reserve all activities and products that are available on our website. Do you need to modify or cancel your reservation? We will be happy to solve your doubts. Are excursions organized with a specialized guide and driver? Yes, excursions are organized with specialized guides in the client's language, and whenever they require travel they are accompanied by transport and driver. Depending on the amount of people to participate can be from a taxi for 2 people, a minibus or a bus with 40 seats if it is a group or a collective tour. In all cases it is about cars with air conditioning with quality standards and international security, and with driver in charge of it. 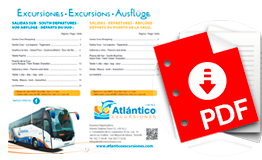 If you can not find an answer to your doubt, contact us directly at the following email address info@atlanticoexcursiones.com or through the following form.